[From GCC:] The premise is that the additional cost to consumers of full-function zero-emission vehicles (ZEV) or near zero-emission vehicles—whether full battery electric vehicles, plug-in hybrid vehicles or fuel-cell vehicles—can be partially offset by providing grid power support to utilities or major power consumers. Emergency power supply. One vehicle with 20kW line connection could power 12 houses at average load of 1.5 kW/house. V2G offers very fast response, with a clean power source that can replace diesel generators. Storage and integration with renewables (e.g. wind power). Several new studies are highlighting (and were discussed in more detail at the ZEV symposium by one of the authors, Willet Kempton) the potential for PHEVs and BEVs to augment the use of wind resources, in some case doubling the effective power generation, or even enabling a 50% wind mix. Electric transit power support. V2G can power traction spikes for local rail, and use a variety of billing/charging schemes to encourage customers participation. This was discussed in more detail by Eugene Nishinaga from BART—the Bay Area Rapid Transit organization. Tomic discussed the analysis of the potential of two fleets of EVs for ancillary services: 100 Th!nk City EVs in New York, and 252 Rav 4 EVs in California. Both studies, each in different markets, showed significant economic potential for V2G providing ancillary services. Important parameters in the assessment were the market value of the ancillary services, the kW capacity of the vehicles nd electrical connections, and the kWh capacity of the vehicle battery. Willett Kempton from the University of Delaware then spoke on a project done with SMUD (Sacramento Municipal Utility District) on modeling V2G for a utility with a high wind generation portfolio. Wind is wonderful low-cost, low-CO2 power, but it fluctuates. For utility operators, a heavy reliance on wind thus raises the problem of ancillary services needed to handle the minute-by-minute and hourly fluctuations. Kempton and his partners at SMUD are proposing a paradigm shift: the use of the customers’s vehicle fleet to provide responsive charging (G2V when too much wind) and discharging (V2G when not enough wind). 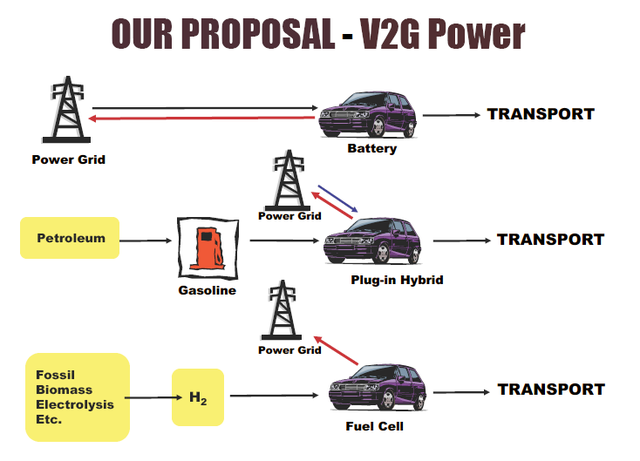 As a more modest first step, the V2G-capable vehicles could provide A/S, especially short-term regulation, to manage wind fluctuations and match to ramp rates of gas-fired generators. A more aggressive approach would be to use V2G as storage to move summer night wind energy to serve the next day’s peak load. SMUD serves some 570,000 households, and has a peak summer-time load of 3,300 MW and a minimum load of 750 MW. SMUD currently has 39 MW of wind power, but plans to grow it. Kempton and co-author Cliff Murley from SMUD calculated the vehicle numbers required to support three scenarios—39 MW, 250 MW and 850 MW—assuming that 100% of wind capacity was needed for regulation, but for less than 1/2 hour. In a scenario with full BEVs, they found that only 0.3% of households would need to be online (1.950) to provide summer wind regulation for 39 MW. With PHEVs, the requirement was higher—3%. They concluded that BEVs could offer all wind regulation and storage needed. PHEVS could provide regulation but may not be large enough for diurnal wind storage. More detailed studies and modeling are needed, but the emerging picture is that there is an economic incentive for utilities to electrify transportation and to capture value back to the utility. Money that would have gone to pumped storage or combustion turbines instead goes to ZEVs. Eugene Nishinaga from BART took that further, with an analysis that suggested it might be in BART’s interest to fund the conversion of hybrids to PHEVs and establish charging stations at BART stations. BART schedules power in advance and buys, in essence, in bulk. If BART demand is lower than projected, it still pays for the scheduled power; excess power required above the scheduled levels costs more than three times the base amount. Having commuter fleets of PHEVs at BART stations for charging and discharging could save the transit company more than $260,000 per year by reducing extra energy purchases, according to Nishinanga’s analysis. W. Kempton and J. Tomic, 2005 “Vehicle to Grid Implementation: From stabilizing the grid to supporting large-scale renewable energy”. J. Power Sources Volume 144, Issue 1, 1 June 2005, Pages 280-294. doi:10.1016/j.jpowsour.2004.12.022. The concept is interesting but does it make practical sense? A major hurdle seems to be that EV owners would give up some control over the availability of their vehicle. Smoothing our minor grid peaks is one thing but would this potentially result in getting into the car in the morning and finding you only have half a charge. Also, EVs will tend to have daily cycles. From the solar perspective, it sounds good to have EV as a source at night but that is when most would be charged. It would be quite an infrastructure change to charge them in the daytime when solar is avaialable. Solar also has a significant summer/winter variance that would reduce this synergy. Wind is another story. Wind is not a predictable daily cyclic source. In some areas, wind is low at night. Other areas have low wind periods for months at a time. One of the major factors in last summer's electric shortages in California was that wind capacity factor dropped below 10% for most of the two week heat wave because high temperature tends to coincide with low wind speed. Another concern is how much hardware would have to be distributed to all the cars - which are relatively small sources. Plus the added grid losses. I really wonder how this economically compares with flywheels or compressed air storage? Thanks for your comment Keng. You are right that EV/PHEV owners would have to be willing to give up some of their control over the availability of their vehicle to participate in VTG programs. But I can't imagine any system where EV/PHEV owners were forced to participate in a VTG system, but would imagine that vehicle owners would voluntarily decide to plug their vehicles into a VTG-enabled charging port. They could also presumably use on on-board computer to specify a minimum level of charge that would have to be maintained in order to ensure they can make the trip home from work or wherever they are. So yes, you might get into your car in the morning and find that you only have a half a charge, but only if you had specified that you were OK with that ahead of time (and you'll find your account credited with the use of your vehicle's battery for that evening as well!). The idea is that car owners could not only use their vehicles for transportation, but could also rent out the use of their vehicles for energy storage, grid management, or emergency power, all-the-while reducing the overall cost of owning and operating their vehicle. As far as charging from solar during the daytime, most folks drive their cars to work (or to mass transit park-and-ride garages) and then let them sit in parking lots/garages for 8 hours while at work. This would be a perfect time to charge from solar panels and a garage/parking lot equipped with solar charging stations could charge the people parking their to charge-up while at work. It's also worth noting that using solar power to charge vehicles is a much more cost-effective use of solar power than providing electricity for your homes or businesses (at least when compared to what we currently pay for gasoline). Retail rates for electricity are roughly 5-10 cents/kWh in most areas (with some outliers). The levelized cost of electricity from solar photoltaics, even with incentives, is still quite a bit higher than that, meaning that PVs aren't very cost effective for electricity generation at this point. But energy for transportation is much more valuable than electricity for use in your homes or businesses. There's about 124,000 Btus per gallon of gasoline, or about 36.34 kWh. At $2.75 per gallon, we currently pay about 7.6 cents/kWh of transportation fuel, about what you pay for electricity. But an EV is 3-5 times for efficient than a gasoline internal combustion engine (ICE) vehicle, meaning that each kWh of electricity used to power your vehicle is actually the equivalent of 3-5 kWh of gasoline in an ICE, which would cost 23-38 cents, a price even PVs can match. So, at the prices we currently pay for transportation energy, solar PVs generating electricity for electric vehicles would be cost effective. (Of course, if we adopted EVs/PHEVs, electrity from photovoltaics would still have to compete with much cheaper electricity from the grid, but it would be cheaper than what we currently pay for gasoline). Also, as far as high temperatures coinciding with low wind speeds, that may be the case in some areas, but is not a universal rule. For example, the wind farms up here in the Columbia River Gorge area of Washington and Oregon often get higher wind speeds when it is hot as the difference in temperatures (and pressure) on the east and west sides of the Gorge cause strong air flows through the Gorge. Wind speeds and their correlation with temperature vary based on local topography and climate. Finally, as for the cost comparison between dedicated flywheel or compressed air storage and use of VTG-capable EVs/PHEVs, you have to consider that we're assuming the batteries in the EVs and PHEVs are already purchased for use in the vehicles. They thus represent an existing idle resource that could presumably be utilized for far cheaper than a dedicated energy storage system. VTG would seem to save both utilities and car owners money by taking better advantage of idle resources - namely vehicles' on-board energy storage. While in theory this might appear to be a good idea, the articles I have read on V2G neglect the most important fact - that a batteries lifetime is directly proportional to the amount of charge/discharge cycles - they are definitely not a zero cost storage mechanism, which is an assumption made in all the 'formulas' that the supporters are putting out. Also, transmission loss as well as equipment cost is greatly underestimated - you need quite a bit of equipment to turn 20KW of DC into AC, and that is by no means an efficient conversion. So while you might have a lower power bill, you'll be replacing your batteries more often. You'll also have a really big box on the side of your house that gets very, very hot when load is up. If storing energy in batteries to supply the power grid made sense, then the utility company would be doing it already. Peak demand can be handled in far, far simpler ways. 4) Put LED lighting in your house. 6) Turn off your computer, and throw it away. Anon writes: "While in theory this might appear to be a good idea, the articles I have read on V2G neglect the most important fact - that a batteries lifetime is directly proportional to the amount of charge/discharge cycles - they are definitely not a zero cost storage mechanism, which is an assumption made in all the 'formulas' that the supporters are putting out." This is a very good point, and I'm not sure how well it is taken into account by VtG proponents. I don't think it's a show stopper though, and would simply require the cost utilities paid to use the vehicle's on-board storage capacity for grid management would have to take the wear on the batteries into account. I do agree though that it would probably mean that a battery would not last the 10-year, 150,000 mile standard life of a vehicle if it was used heavily to provide grid management services in a VtG system. Current specs for EV and PHEV batteries call for them to be able to last long enough to last the useful life of the vehicle (10 years/150,000 miles). From what I've read, they'll be able to do this before too long, but won't have much extra charge cycles to spare for VtG, so you are probably right that using your vehicle to provide VtG services would mean you'd have to replace your battery at some point during the life of the vehicle, at considerable expense. This expense would have to be justified by the income you earn from providing VtG services. Setting up a VtG infrastructure is not a trivial issue (then again neither is setting up a new hydrogen infrastructure!) but it could still very well be worth it. I think we should focus on getting PHEVs on the road soon first, rather than getting VtG going. If we get a sufficient number of plug-ins or EVs on the road, it may be worth looking at VtG a bit closer.